Throughout the trip, I managed to speak to a few local residents and travelers in the places that I visited. The theme is consistent. 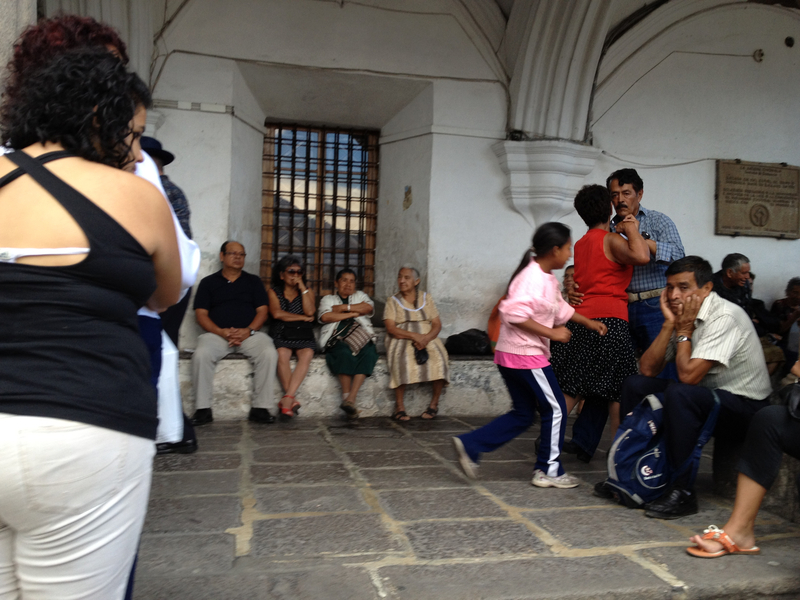 Both Guatemala and Honduras are not progressing in the better direction for the people. In the latter, periodic polling by an internationally accepted agency, shows zero confidence in the progress of the country and the government. In the former, a recent poll shows low confidence in the government, judicial system, police, and economy, among others. And the only strong belief they have is in religion. I heard Honduras overall (Copan Ruinas where I went is quite safe) has the highest homicide rate in the world (over 80 homicides per 100,000 people). Their population is about 8 million. With the fight against the drug cartels intensifying in Mexico, apparently the drug trade/routes are pushed South into Guatemala and Honduras. With the weak system in both countries, more dangerous and turbulent futures are inevitable for the people. In Honduras especially so. It is a poor country with no substantial revenues to speak off and large areas with no infrastructure and governance. Recently, they did overtake Colombia as coffee exporter (no 3 in the world). They have a small maquiladora industry (Nike, Levi’s , etc). They export fresh Tilapia to USA and farmed prawns. The drug business though, is much larger in value than all these industries combined. In larger cities of Honduras (Tegucigalpa and San Pedro Sula) for example, it is getting difficult for business and homeowners. There is always news of taxi drivers and bus drivers being killed – probably for refusing to pay protection money. And this has spread to homeowners and factories as well. There are more gangs, more organized extortions. As a tourist, one would probably not be exposed to this situation or realized the undercurrents. And if one goes to the very touristy places, like Copan Ruinas or the Bay Islands, one should exercise common sense and one will be fine. I did not go out late at night on my own and I do not go to secluded places alone. I was fine. I definitely found that walking around in Guatemalan towns was more comfortable than walking around in Copan Ruinas on my own. This is before I knew the above stories. But again, Guatemala is better prepared in resisting the drug trade. Guatemala has relatively more industries to speak of. 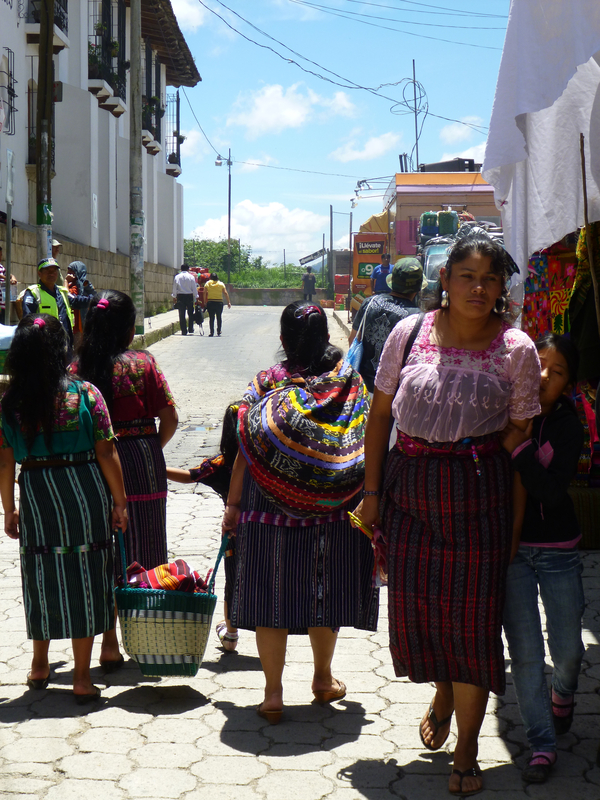 60 percent of the population is indigenous Mayan and are in a more closed communities. 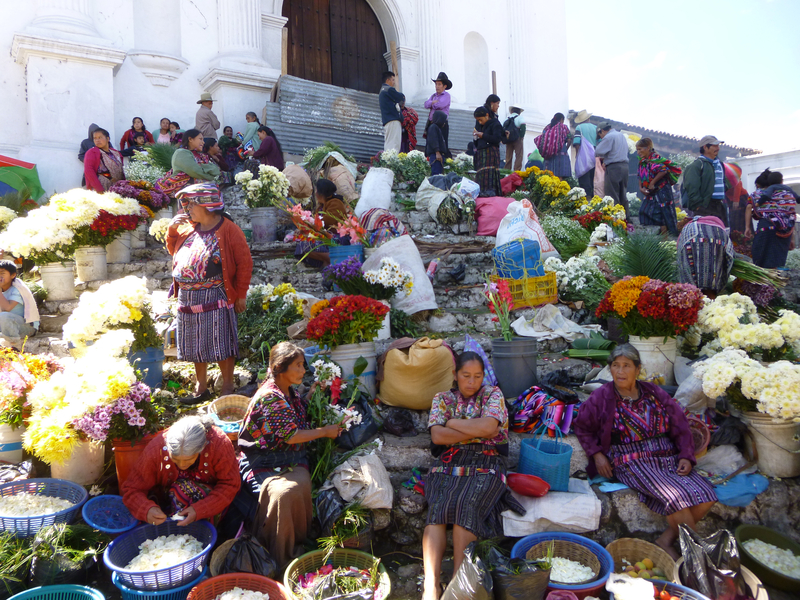 In my experience (and confirmed and verbalized by a fellow traveler from NY), Guatemalans are kind and much warmer and welcoming (except in the crazy Chichi market!). The Hondurans are nice in a more distant way. Don’t get me wrong though! I did meet a lovely, warm, welcoming lady at Hacienda San Lucas (in addition to the equipo at La Casa de Cafe). Her name is Patty and she made my short visit to Hacienda San Lucas a very memorable one). 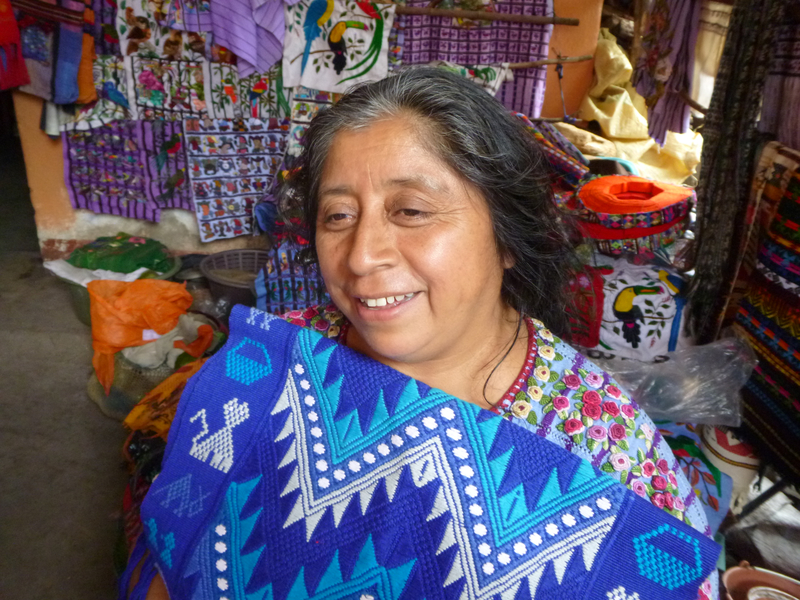 Mayan Lady in Her Huipil and My Purchase!